This is the Fillebrown House (photo credit to the White Bear Lake Area Historical Society). 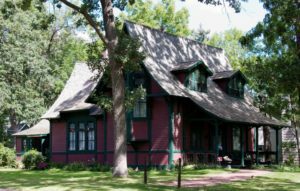 The “cottage” was built in 1879 on the shores of White Bear Lake in Minnesota. 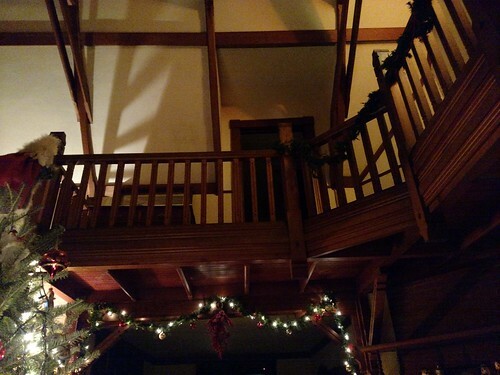 I was born and raised in White Bear Lake and in all of my years I’ve loved this house, but had never seen the inside despite tours being available for years. I didn’t know who the Fillebrowns were, but learned a bit about them when Husby and I attended the tour. Quite frankly, I didn’t attend the tour to learn history, but to only, finally after many decades, see the inside of this house. Yes, I learned some things, but my eyes were working much more than my ears during this tour. Sara Markoe delivered some of the history of the house while the “tourists” held (battery operated) candles to guide us through the dim, candlelit house. 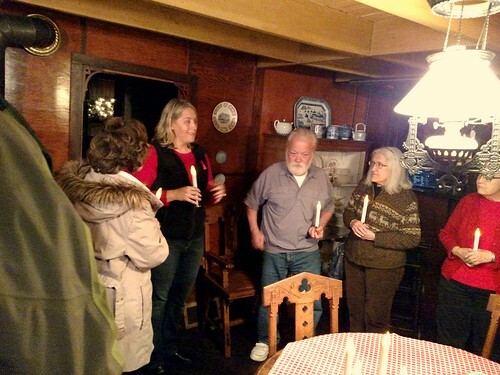 Rheanna O’Brien was also aboard the tour, guiding us safely through the old house. 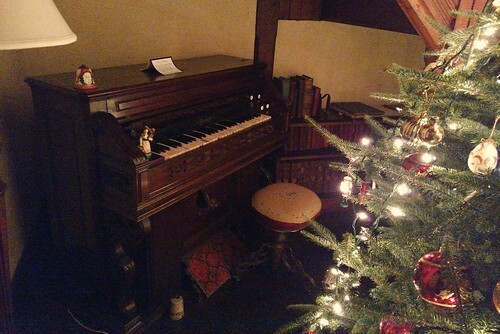 This post isn’t about the history of the house, although the walls are rich with stories. Because I’m who I am, it’s all about the architecture and feel of the house. I love walking through houses built generations before me. 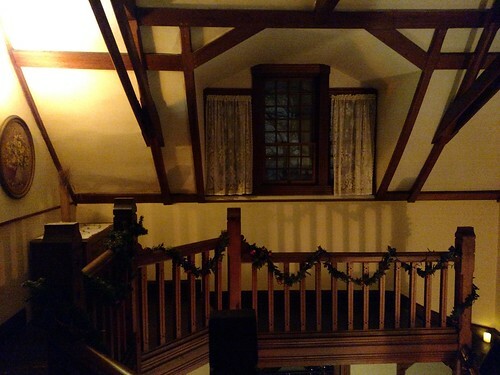 The Fillebrown House gave me a cozy feeling I haven’t felt for quite some time. 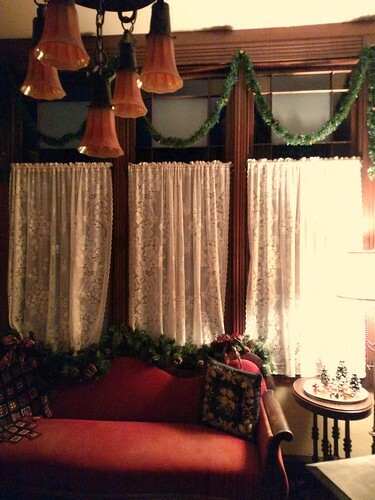 Windows galore, for views of White Bear Lake, covered nicely with period lace curtains. 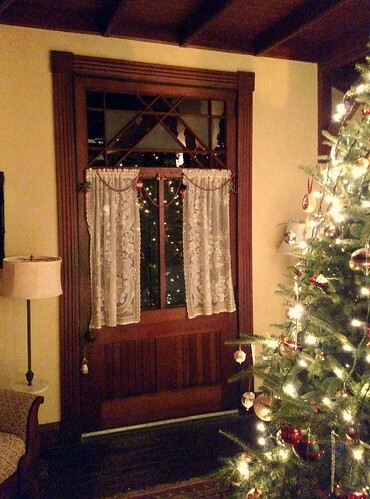 And a big, heavy, wide door, which leads out to the porch, which looks out onto the lake. The whole feel of the place made me want to buy it, on the spot. 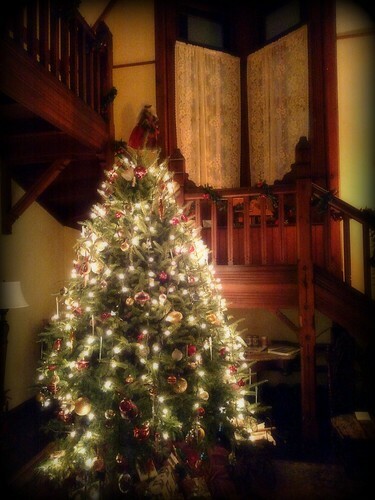 I love this house and how it’s been maintained by the White Bear Lake Area Historical Society. 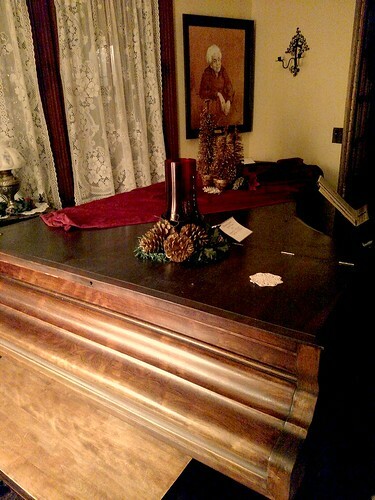 Because of the candlelight ambiance of the tour the house was dim and not too agreeable for my amateur photo taking. 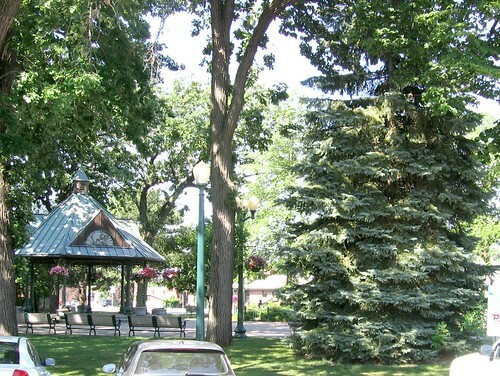 Husby and I plan to go back in the summertime when the White Bear Lake Area Historical Society offers inside tours in addition to outdoor musical events and lemonade on the porch. I’ve added the Fillebrown House to my list of dream houses. Perhaps I can live in any number of my dream houses in future lives. Maybe I love them so because I lived in them in past lives? 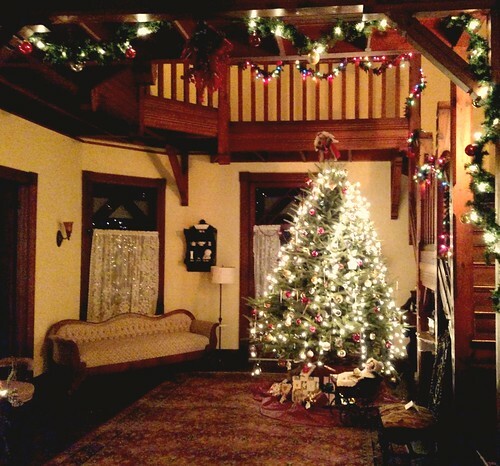 If you have the opportunity, take advantage of events at the Fillebrown House in White Bear Lake, MN. 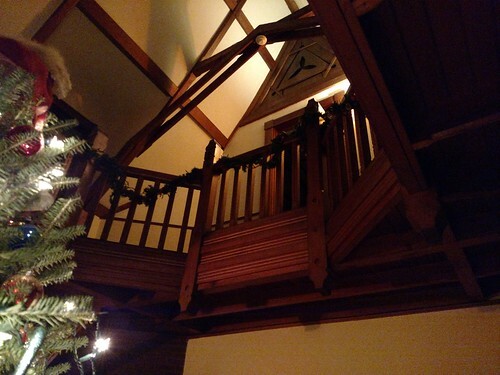 You’ll be transported to a time of the glamorous lakeside cottage. 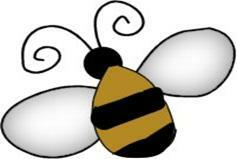 You might know by now that Auntie B’s Wax products can be found in a shop or two around town. It’s so cool to be included in shops that contain the works of some of the best artisans around. This month the White Bear Lake Magazine did an article featuring The Farmer’s Daughter. This shop is the best, the owners are geniuses at how to run a business and treat their artisans and patrons with love and respect. 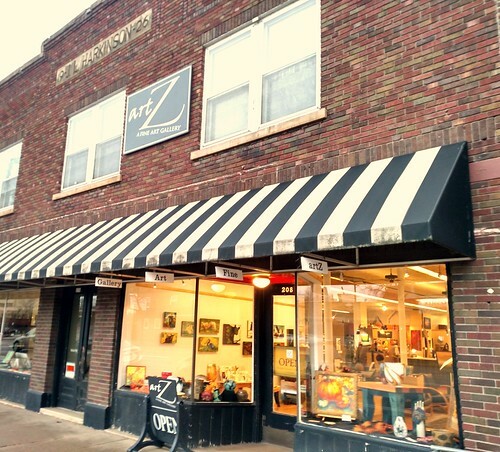 I’m proud to be a part of this great shop in White Bear Lake. Auntie B’s Wax has a bunch of stuff for sale in this shop, and even more thrilling terrifying is that Carrie and Lynn asked me to be one of the artisans interviewed for the magazine article. 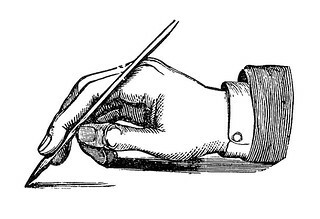 The interviewer was great, the fact-checker was kind of scary (did I really say those things?!) and the final printing made me look kind of, well, artistic. I’m sheepish and humble about the whole thing, but deep, deep inside I’m pretty proud. If you’re ever in White Bear Lake, check out The Farmer’s Daughter. They have a shop full of really fun gifts, and even more importantly things you’ll need in your own life. 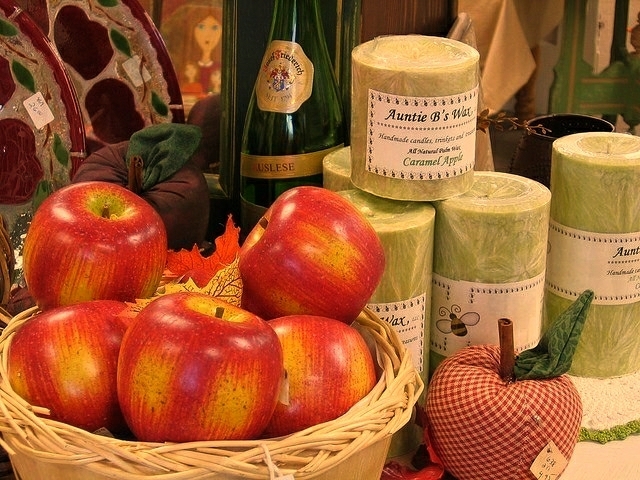 The shop itself is welcoming, the owners and staff are friendly and helpful, and the items for sale, well, they’re just wonderful…if I may say so myself. It was a cold and snowy night. The dive was to be chosen by me and Husby so we decided to keep it local, avoiding a slippery and treacherous ride for Ruthie and Ray. 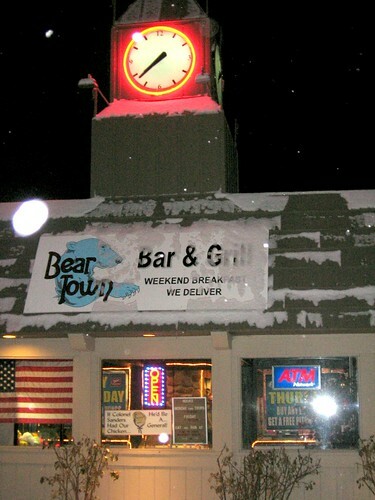 We chose the Beartown Bar & Grill, or Beartown Lounge, or whatever it’s called. They don’t have a website but if you Google Beartown you can find some stuff on it. Those are snowflakes you see glowing against the dark sky, not orbs from beyond the veil. We walked in and saw on the floor a sign that said, Please wait to be seated. So we did. It didn’t take long for someone to come and greet us and she asked, “where do you want to sit, bar or dining room?” We all kind of looked at each other, then let her know we would sit anywhere she decided to put us. She hesitated. I turned to Husby and said “if we can sit anywhere we want why did the sign on the floor say to wait to be seated?” Well, someone spoke up and said dining room so that’s where she took us. 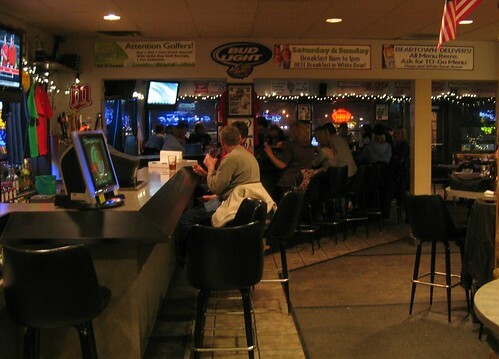 This is the bar, the place we didn’t sit. 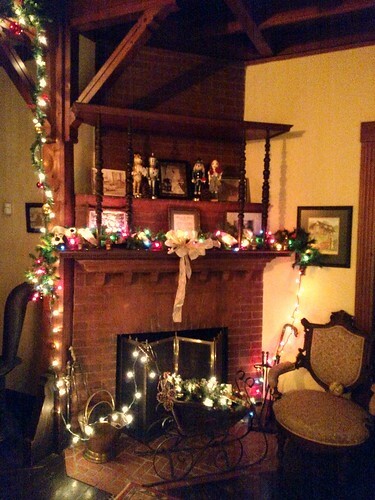 This is the dining room, the place we did sit. It’s like we were put in the room of shame. Weren’t we cool enough to sit with the regulars? We started out with some cocktails. I must say the drink specials were hard to resist. Buy one get one for $1.50, except for tap beer. Ruthie and I got a couple of wines each, Husby got a couple of Greyhounds, and Ray got a tap beer. The waitress asked if he was sure, because he wouldn’t get the deal with that. Yes, he was sure. Even though we were set away from the crowd in the bar the service was pretty good. We actually had three people checking in with us throughout our visit. So once we got our cocktails we ordered appetizers. Ruthie and Ray got chips and salsa. The chips were pretty good. 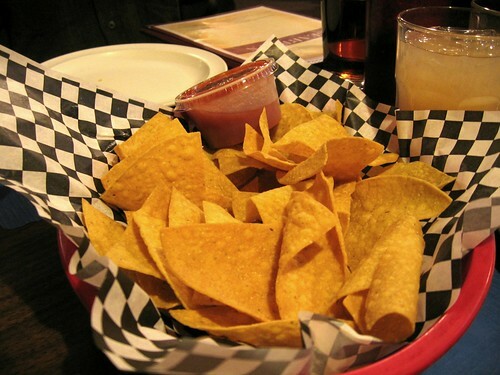 The salsa was more like picante sauce, not chunky, and not really enough was supplied for a whole basket of chips. It was all pretty good though. 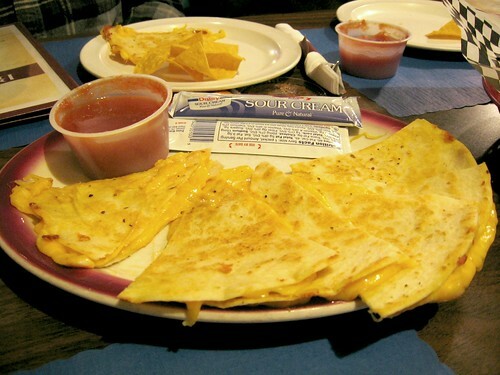 Husby and I ordered the cheese quesadillas. It came with the same “salsa” as the chips, and also a couple of tubes of sour cream. Tasty and cheesy. In case you’re new to the dive night reviews, each couple orders an appetizer and we all share. So far you might think this is going to be a Mexican meal considering the appetizers we chose, but that’s not the case. I ordered the fish fry special and I totally forgot to take a picture of it so you’ll have to rely on my description. The waitress said “sometimes they give you a choice of cod or pollock but I don’t know if you get a choice tonight. If you had a pick which one would you choose?” I told her it really didn’t matter, and I have no idea what kind of fish I got because I’m not a fish connoisseur. It was white and flakey. However, the batter was pretty greasy and was pretty nondescript as far as flavor is concerned. My dinner came with waffle fries and seasoned sour cream. 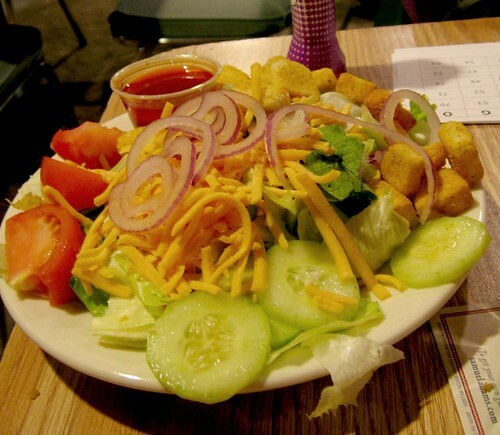 I also got a side salad which was also pretty nondescript, but salads are always pretty nondescript to me. I ate it all up so it must have been good enough. And now on to the other meals I remembered to photograph. 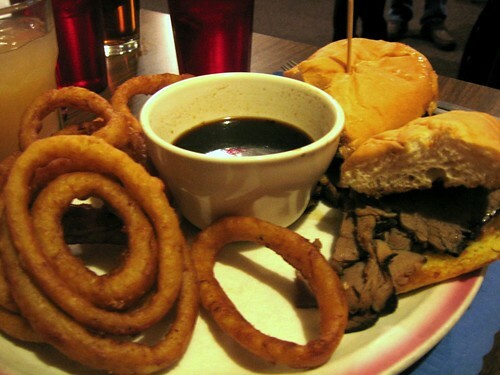 This is Husby’s French dip sandwich with onion rings. 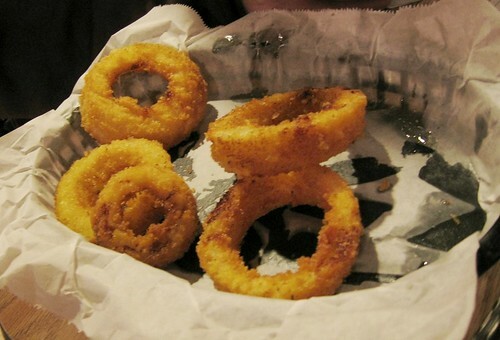 He liked the onion rings because he could bite them without having a string of onion sliding out of the batter. He didn’t have much to say about the sandwich. “It’s okay,” he said. 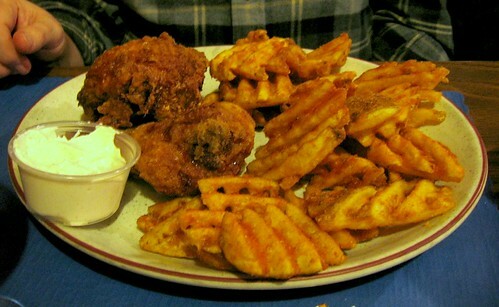 This is Ruthie’s chicken with waffle fries. The cup of white stuff is seasoned sour cream for the fries. She said the chicken was okay but “it could have a little more seasoning.” The dinner allowed two pieces of chicken and she got her choice of what pieces she wanted. She chose two thighs. She also had a side salad with her dinner. It was very clear that none of us was overly thrilled with our meals. We came to the conclusion that seasoning is not high on chef’s list of priorities. The appetizers were fine, so we decided that if we had been sitting in the bar and were half in the bag with a big case of the munchies the appetizers could satisfy a need for food. Going for dinner? Never going to happen again. 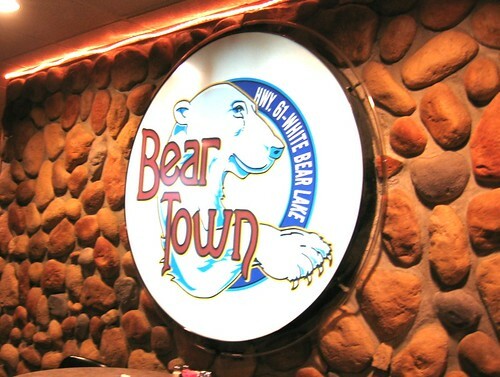 I was extremely dissatisfied with the food at the Beartown Bar & Grill, although as I said before the service and drink specials were good. I can’t close out this post without mentioning that this restaurant used to be called Big Ben years ago and served the best pie in town. Like, the best. The Beartown doesn’t even serve pie. Although if they did they’d probably have canned filling and soggy crust. None of us was happy with our dive experience at the Beartown, but we all agreed we’ve been pretty lucky over the past few years with the other dives we’ve tried and we deserve to come across a clinker once in a while. Beartown is definitely that clinker. Dive Night is a once monthly adventure undertaken by me and Husby, along with our friends Ruthie and Ray. Each couple alternates choosing a restaurant, one which must come under the category of “dive.” Our definition of dive: a neighborhood gathering spot with a laid-back atmosphere and good food. We’ll find the interesting hang-outs in the Minneapolis/St Paul area. Casual attire required. A sip of beer or wine doesn’t hurt either. I’ve been sitting on this post for two months with severe anxiety that I wouldn’t be able to do the VFW experience justice. 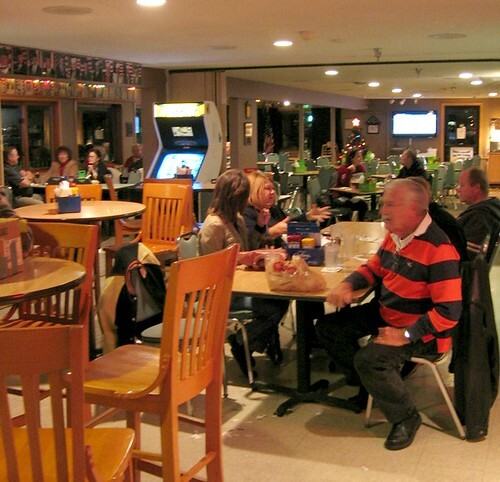 Ruthie and Ray had previously visited the White Bear Lake VFW and found it so endearing they decided to invite us to experience it with them. There was one catch ~ we had to go on a Thursday night rather than a Friday as we usually do. We huffed out our compromise and agreed. What made Thursday night the better pick? You’ll find out soon. The place was occupied with more people than I guessed it would be. Probably because it was Thursday. Don’t worry, I’ll get to that. It’s also bigger than I thought it would be. What’s a dive bar without pull tabs? 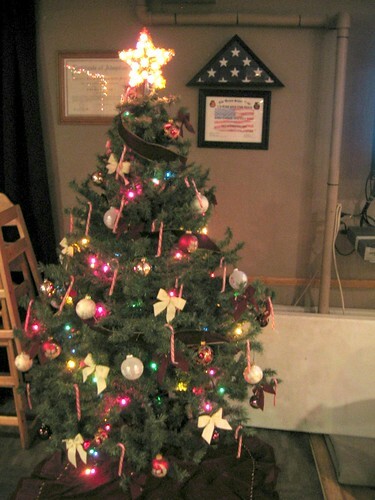 As I said before, this post has been sitting in my queue for a couple of months ~ when we went the VFW was even decorated for Christmas. The food was surprisingly good. I’m not sure why I was expecting less, but I was very pleased with the taste and quantity of food. 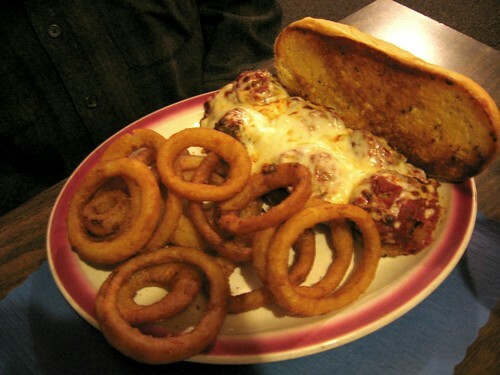 We started out with some onion rings that contained just the right amount of grease, enough to leave spots on the paper liner, and artichoke dip that was scrumptious. Onion rings, crispy and golden brown. I didn’t get a picture until they had been nearly eaten up. 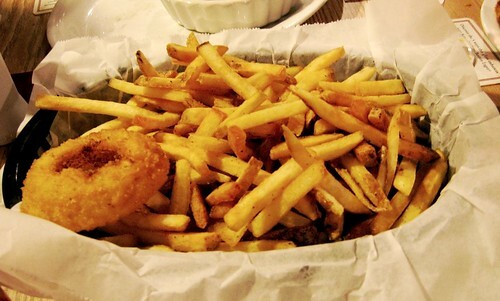 The basket was mounded full of fried goodness. 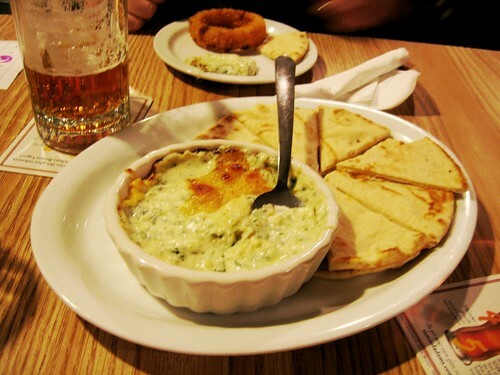 Really good artichoke dip and pita bread. Husby started his meal with a “side” salad. The thing was enormous! 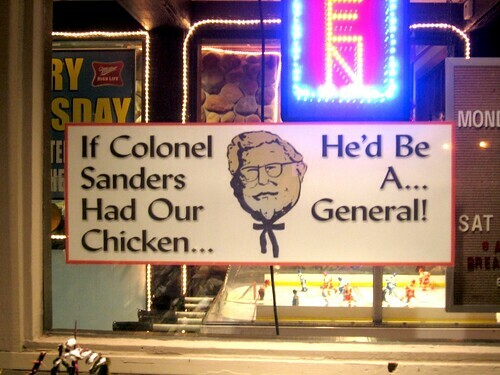 He reported it to be cold and crispy and flavorful. Sandwiches and burgers come with chips, but I asked to have fries substituted. I don’t know if it was a misunderstanding or what, but I got a huge basket of fries plus chips with my meal. I shared the fries with everyone because there were too many for just me. I think the waitress put me down for an entire appetizer-sized order of fries. They were pretty good though, and I’m glad I got them. Onion ring not included with the fries. Ray and Husby both got the bacon cheeseburger. They were juicy and hot with plenty of bacon. 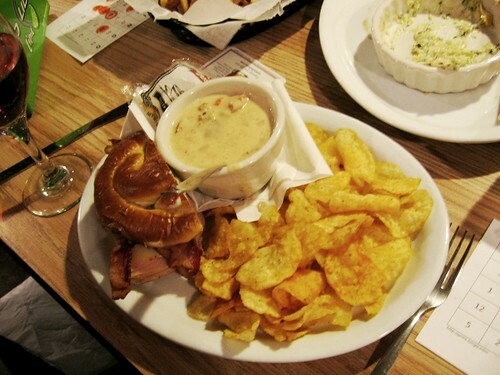 Ruthie and I had the half sandwich and a cup of potato bacon soup. Our sandwiches, ham and cheese melt for me and turkey bacon melt for Ruthie, were made on a very tasty pretzel roll and were very flavorful, but could have been hotter. The soup was fabulous and very hot. 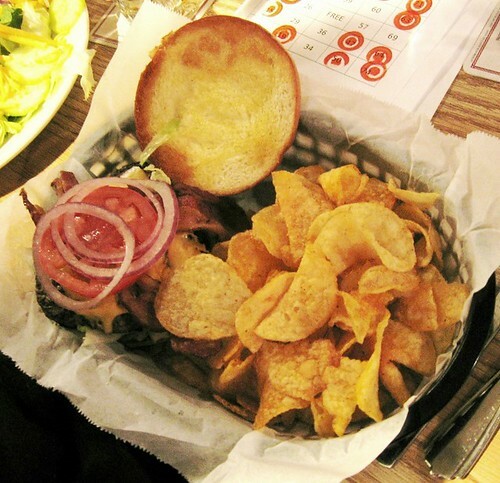 The bacon cheeseburger with chips. Half sandwich and a cup of soup, with chips of course. We were all really pleased with our meals, with the exception of the luke-warm temperature of the sandwiches Ruthie and I had. After being satiated with good food and a libation, we were on to the highlight of the evening…V-I-N-G-O! VINGO is exactly like BINGO except they use a V for Veteran. OK, I’ll let that one go. When it comes to those who have served our country I’ll pretty much let them have their way. 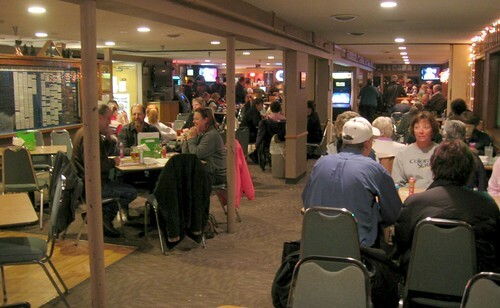 Three Thursdays a month the White Bear Lake VFW offers the fun and excitement of VINGO. 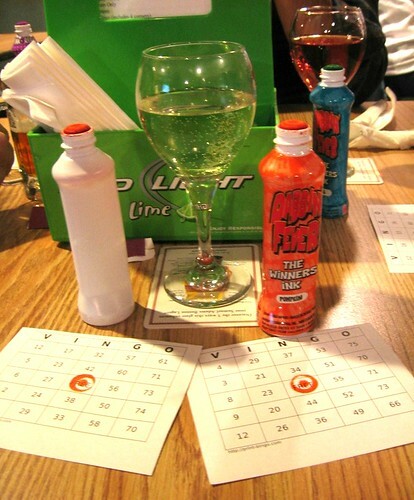 The interesting thing about this VINGO game was that winners got jello shots. Yes, you heard me right. 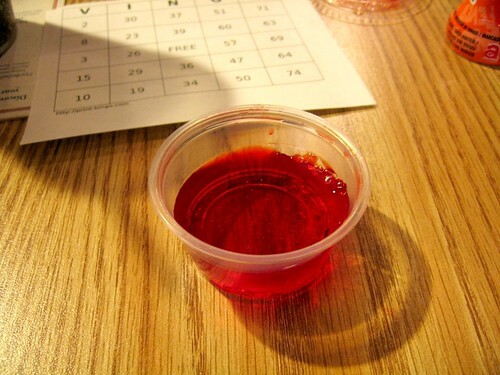 I’ve never had a jello shot in my life, and I recall them from the ’80s as being slurped out of a test tube-type vessel. 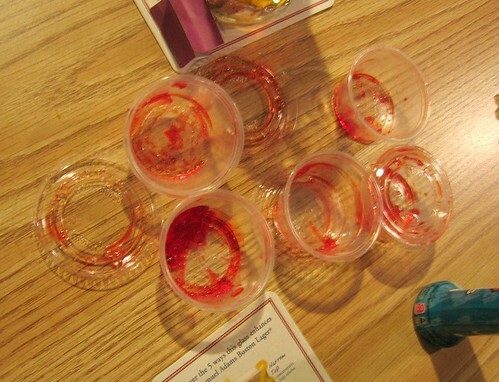 The VFW jello shots were served in little plastic condiment cups with covers. The jello shot guy walked around with a crate of these things, handing them out to the winners of the game, and even to those who didn’t, because they wanted to get rid of as many jello shots as they could. The shots were as firm as regular jello. We loosened them from the plastic cup with a fork, then chewed/swished/swallowed the whole thing at once. I really wanted it to taste good, but it didn’t. As I’ve never had a jello shot before that night I had nothing to compare it to, so I don’t know if these were badly made or if jello shots in general taste like medicine. Is this what a jello shot is supposed to look like? Husby ended up eating his with a fork. One of our favorite parts of the evening was when VINGO time was over the jello shot guy had a lot of shots left over, so he asked everyone who wanted a shot to raise their hand. Of course everyone wanted one, including the table full of gray-haired ladies sitting next to us. Interestingly, they took their shot cups from the guy, put them in their purses, and left. We imagined them going home and eating that spiked jello in bed for a nightcap. Can you get pulled over for open bottle if you’re driving with a jello shot in your purse? 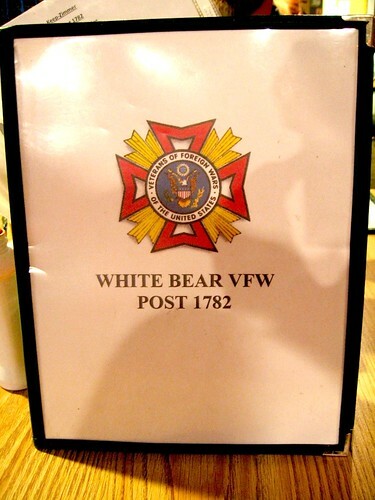 Our evening at the White Bear Lake VFW was one for the records. We had a blast playing VINGO, drinking eating horrific jello shots, and enjoying some truly delicious food. The people working there are really nice and friendly too. If you’re ever in the White Bear Lake area be sure to stop by. This dive gets four thumbs up! It’s summertime in Minnesota and that means we’re all cramming in fun outdoor activities in the few short months we have before the snow flies again. In the case of Husby and me, we’re busy preparing for and attending craft shows and festivals. In the case of Ruthie and Ray, well they’ve been really busy becoming grandparents and throwing wedding celebrations. We’ve been preoccupied with our lives and haven’t been able to tend to Dive Night like we usually do. However, we decided to take a little break from our hectic obligations and have a mini Dive Night, which didn’t even take place at night. 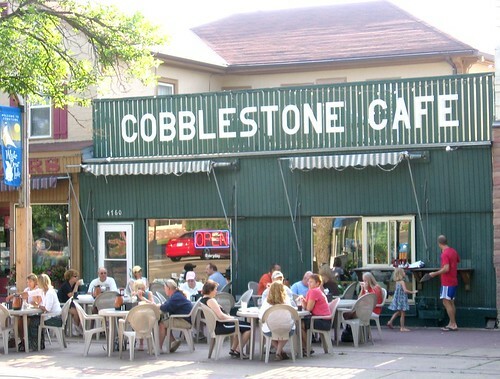 We got up bright and early on a Saturday morning and met for breakfast at the Cobblestone Cafe in downtown White Bear Lake, Minnesota. 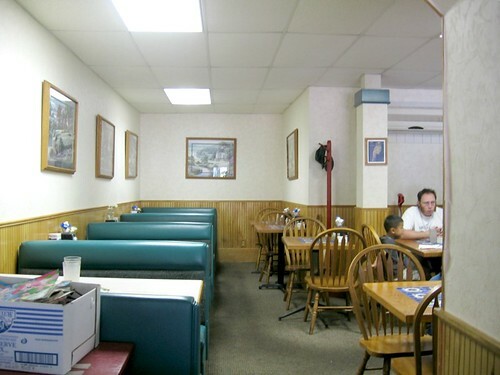 I was surprised to see how many people were out for breakfast at 8:30 on a Saturday morning. Getting a good jump on the day, I suppose. And what a nice place to fuel up! The sidewalk seating is great in the morning as it’s shaded from the sun and has a lovely view of the park across the street. As you can see, the sidewalk seating was packed by the time we arrived, so instead of waiting for a table we opted to eat inside. The decor is nothing to speak of, but it’s a nice, clean cafe. 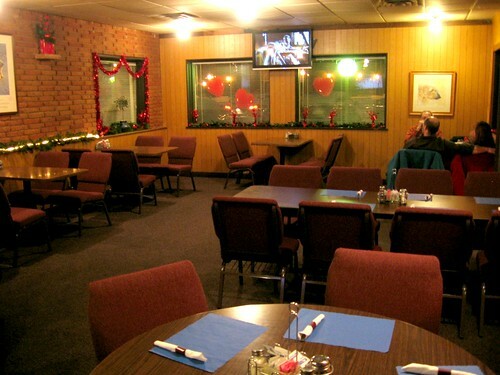 This is also a breakfast/lunch cafe, open from 7:00-3:00 Monday through Saturday and 7:00-2:00 on Sunday. While the four of us told stories about what we’ve been up to our breakfasts were being dished up, and when they arrived we couldn’t believe what we saw. The servings were enormous! 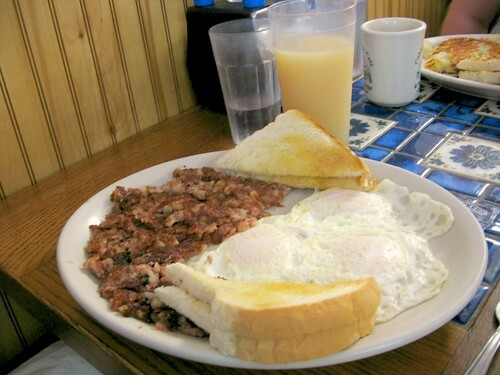 Husby’s eggs over easy and corned beef hash. 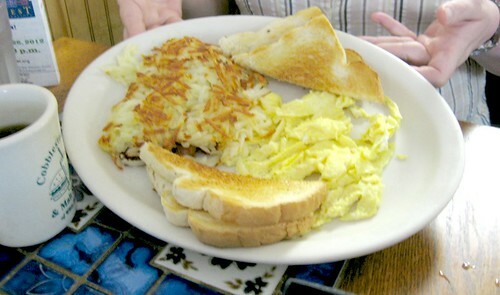 I had a ham and swiss omelette with hollandaise sauce and hash browns. 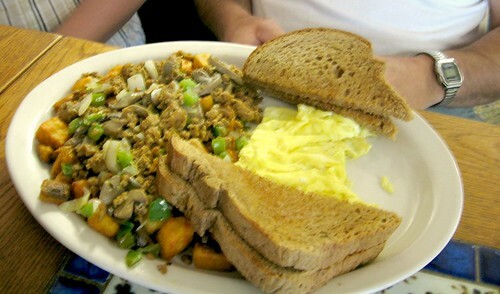 Ray chose scrambled eggs with Italian hash. Ruthie ordered scrambled eggs and hash browns filled with bacon. Husby and I aren’t used to having such a big breakfast in the morning and found ourselves weighed down for several hours after eating. It sustained us the entire day. All of our breakfasts were reported to be tasty and hot. 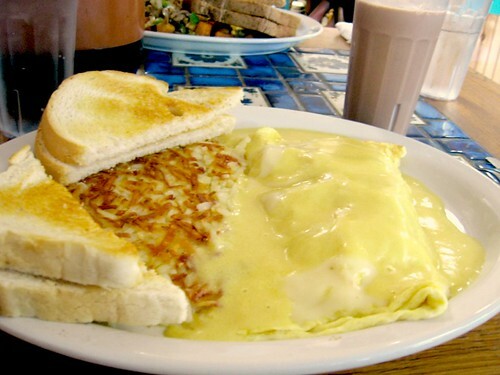 If you’re in the mood for a good, home-cooked breakfast I would highly recommend the Cobblestone Cafe. 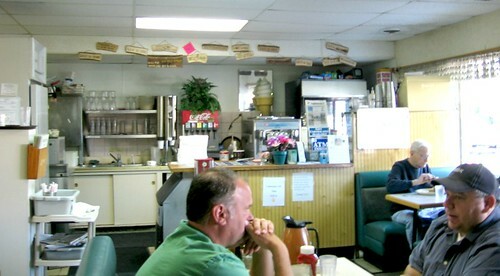 Some day I’ll drop by for lunch; if it’s as good as the breakfasts were, this place is an all-around winner. I also think Dive Morning might have something going for itself. We might have to consider breakfast joints more often ~ if only getting up early on the weekends were more appealing to me.